How much do Ravens suites cost? Baltimore Ravens suite prices typically range from $8,000 - $18,000 for Ravens games at M&T Bank Stadium. Prices vary based on opponent, day of the week, and suite level/location in M&T Bank Stadium. 300-Level suites tend to be more expensive than 400-Level suites. The most expensive game of the year is often Ravens-Steelers. 300 & 400-Level Ravens suite prices for concerts and other events at M&T Bank Stadium can vary widely based on the type of event. 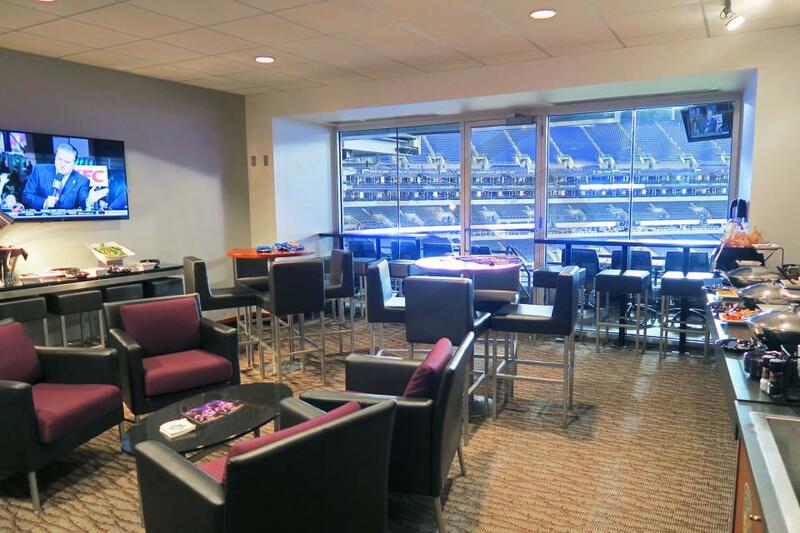 300 Level Suites at M&T Bank Stadium come with 20 tickets included and can host parties with up to 30 guests. These suites include all of the finest amenities available at a professional sporting event, including exclusive access to the 200 Level Club, entrance to the stadium through a private suite entrance, a wet bar, luxurious furnishings, HDTV's, and complimentary WiFi. Suites also come with special catering options and a devoted suite attendant. 400 Level Suites at M&T Bank Stadium come with 20 tickets, and can hold up to 30 guests when utilizing "standing room passes". 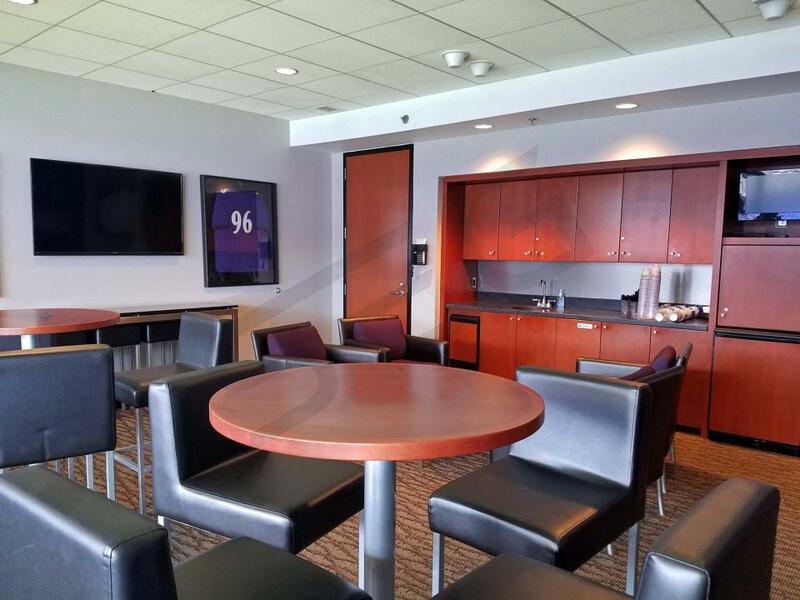 All suites at M&T Bank Stadium include 200 Level Club access, entrance to the stadium through a private suite entrance, in-suite wet bar, luxurious furnishings, HDTV's, and complimentary WiFi. 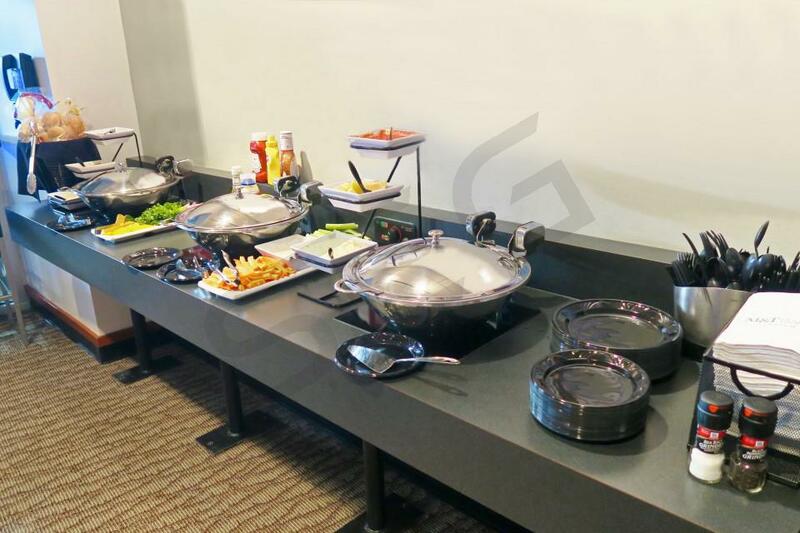 Catering can be ordered directly in the suite. The Baltimore Ravens are ready to put an end to their playoff drought and get back into the post-season for the first in three years. To boost their offense, the Baltimore Ravens added two receivers in free agency, Michael Crabtree and Josh Brown. With a few new faces to throw to, Joe Flacco could be lined up for a bounce back year. Alex Collins has taken over running back duties for head coach John Harbaugh and exceeded expectations last season. On defense, the Ravens first-round draft pick in 2017, Marlin Humphrey, looks to be a franchise cornerstone. With Humphrey in the secondary, the Ravens will have Eric Weddle, Tony Jefferson and Jimmy Smith. New defensive coordinator, Don Martindale, will lean heavily on his linebackers, Terrell Suggs and Matt Judon. 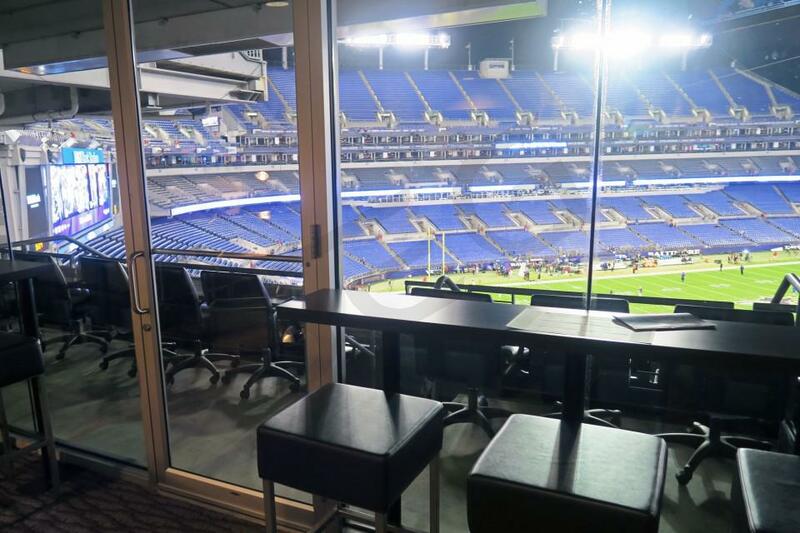 Baltimore Ravens suites at M&T Bank Stadium will provide fans the ultimate VIP experience. Ravens have a choice between two suite levels at M&T Bank Stadium. The 300 Suite Level will be closer to the field but stacked right above that level is the 400 Suite Level. Not a big difference in terms of your vantage point to the field. Ravens suites will include 20-30 tickets and 4 VIP parking passes to any Ravens game. Luxury boxes can be catered in advance at an additional cost. Each Ravens suite will feature private restrooms, a climate-controlled environment, HDTVs and premium seating. The 2017 Baltimore Ravens look to take back the crown of the AFC North. The Ravens play their best football at home in M&T Bank Stadium. With some improvement on the road, the Ravens are right back in the AFC Playoffs. In the 2017 NFL Draft, the Ravens went defense all the way. They selected CB Marlon Humphrey with the 16th overall pick. Defense has always been a priority for the Ravens and they made that clear by selecting four defensive players with their first four picks. During the offseason, the Ravens signed safety Tony Jefferson to pair up with Eric Weddle. They’ve also added Brandon Carr to play opposite to Jimmy Smith. The Ravens resigned Brandon Williams and have two of their biggest leaders back in Terrell Suggs and C.J. Mosley. It looks as if the Ravens are adding as much talent as they can to become one of the best defensive teams in the NFL. Joe Flacco leads the Ravens offense with Mike Wallace and Breshad Perriman to throw to. The running game is still up for grabs with Terrance West, Danny Woodhead and Kenneth Dixon in the mix. As a third option for Flacco, Dennis Pitta lines up at tight end. Here are the opponents coming to M&T Bank Stadium in 2017: Cleveland Browns, Pittsburgh Steelers, Chicago Bears, Miami Dolphins on Thursday Night Football, Houston Texans on Monday Night Football, Detroit Lions, Indianapolis Colts and the Cincinnati Bengals. 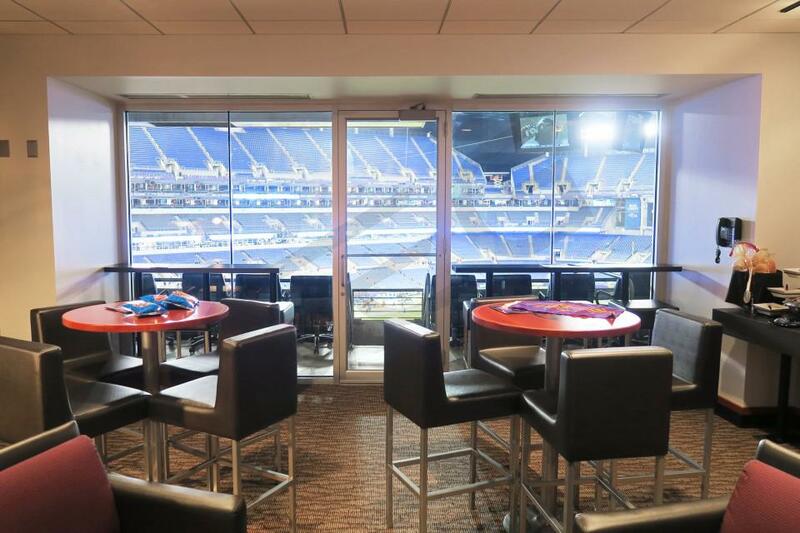 Suites and Special Events: Baltimore Ravens luxury suite rentals provide fans with an ultimate VIP experience. If you’re entertaining friend or family or corporate clients, a Ravens private suite is perfect for any occasion. M&T Bank Stadium suites include 20 - 30 tickets, VIP parking passes and in some cases, pre-game field passes. 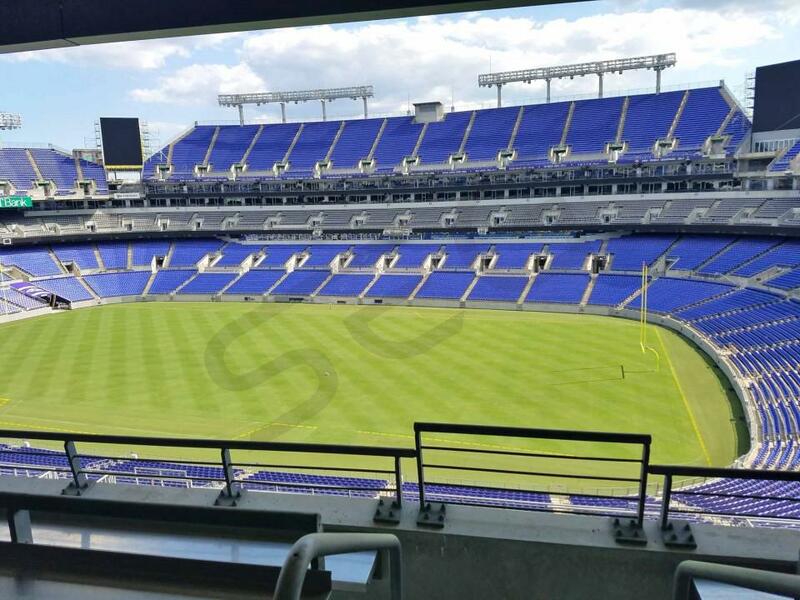 Baltimore Ravens suites will also include private entry into M&T Bank Stadium, exclusive access to stadium clubs, private restrooms, premium in-suite catering options, climate-controlled environment and HDTVs throughout the suite. Offense: Three years after winning the Super Bowl, the Baltimore Ravens really struggled in 2015 going only 5-11. Their season really fell apart when starting quarterback Joe Flacco’s season was ended early due to injury in Week 11. The Ravens finished the season on a 2-4 run, but feel like the season could have gone very differently had Flacco not gone down. Flacco must be happy to have Steve Smith back for his 16th year as the veteran is consistently one of the best receivers in football. Across from Steve Smith will be 2015 first-round pick Breshad Perriman. Perriman lost all of 2015 to injury but the Ravens expect big things from the former University of Central Florida Star. The Ravens also believe that 2016 first round pick Ronnie Stanley will hold down the Left Tackle spot for years to come. Defense: The backbone of this Ravens defense is undoubtedly their middle linebackers. Daryl Smith and CJ Mosley combined for almost 240 tackles last year, which makes them one of the most productive pairs of linebackers in the NFL. Former Bronco Elvis Dumervil led the team with 6 sacks last year, while his opposite, defensive tackle Timmy Jernigan, also finished with 4 sacks giving the Ravens a potent tandem of tackles up front. In the secondary, cornerback Ladarius Webb had an excellent season and led the team with 11 passes defended. Fans should look for the Ravens defense to be solid once again. Schedule: In 2016, the Ravens will host the Oakland Raiders, Buffalo Bills, Washington Redskins, Pittsburgh Steelers, Cleveland Browns, Cincinatti Bengals, Miami Dolphins, and Philadelphia Eagles. 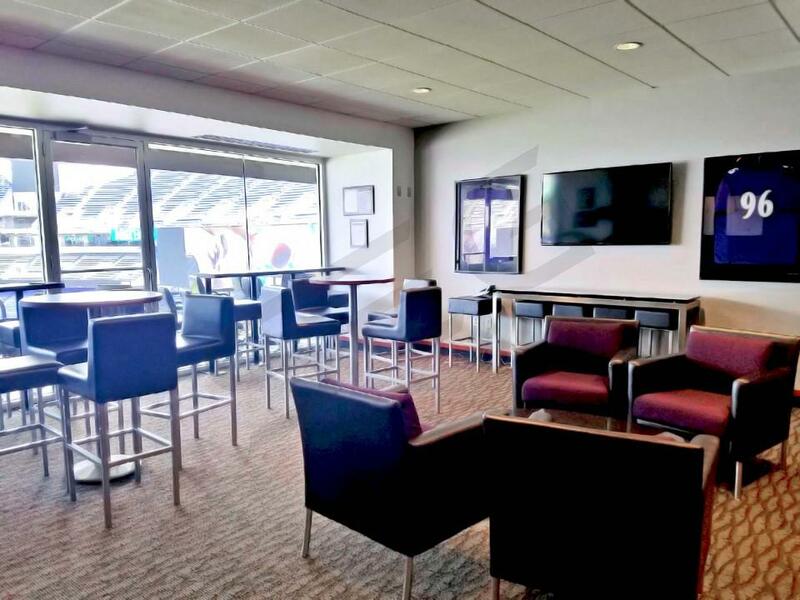 Suites and Special Events: Luxury suites are an ideal setting for any occasion at M&T Bank Stadium. A Baltimore Ravens suite offer an exclusive, private setting for your clients, family, or friends. 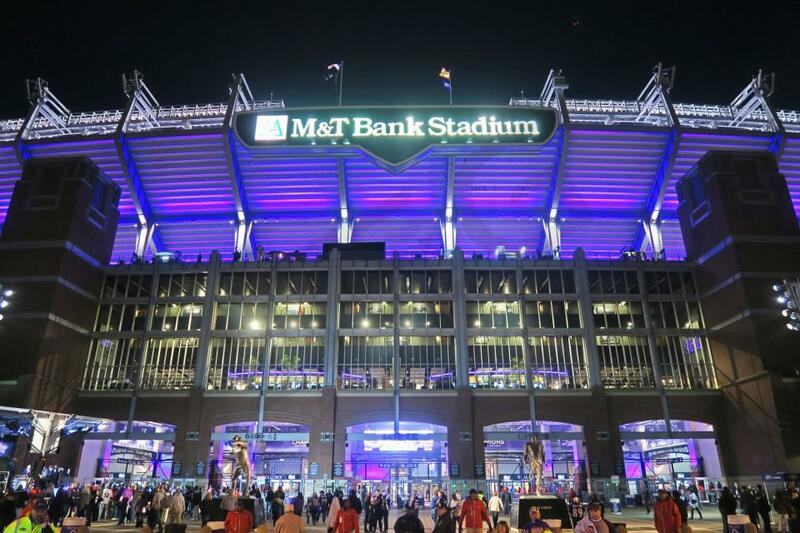 Suites at M&T Bank Stadium for a Ravens game include: 24 tickets, 4 VIP parking passes and the option to purchase up to 10 additional suite tickets. Each guest in a Ravens suite will get private entry into M&T Bank Stadium, exclusive access to stadium clubs, private restrooms, premium in-suite catering options, climate-controlled environment and HDTVs throughout the suite. Army and Navy will also host their annual rivalry game at M&T Stadium. The Baltimore Ravens missed out on the playoffs in 2013 after winning the Super Bowl in 2012. This was the first the Ravens didn't reach the playoffs since 2007. Head coach John Harbaugh will enter his seventh season as coach. The team will focus on improving their offensive behind Joe Flacco, Ray Rice and Torrey Smith. Visiting M&T Bank Stadium in 2014 will be the Jacksonville Jaguars, Tennessee Titans, Atlanta Falcons, Carolina Panthers, San Diego Chargers, Cleveland Browns, Cincinnati Bengals and Pittsburgh Steelers. 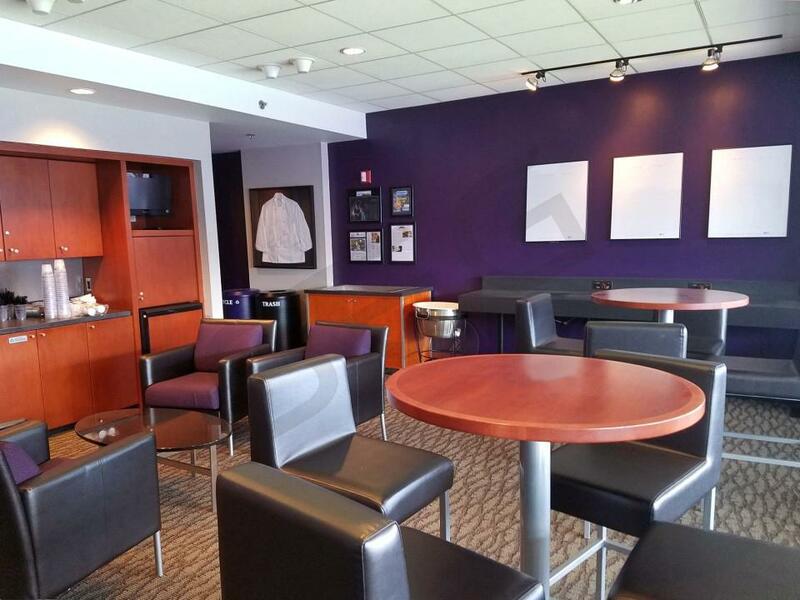 Luxury suites are an ideal setting for any occasion at M&T Bank Stadium. Luxury suites offer an exclusive, private setting for your clients, family, or friends. Game day suites include: 24 tickets, 2 VIP parking passes, option to purchase up to 10 standing room passes, private entrance to stadium and stadium clubs, private restroom, in-suite catering options, climate-controlled environment, premium seating, and HDTV’s. The defending Super Bowl champion Baltimore Ravens are taking back M&T Bank Stadium with authority! Ravens signed quarterback Joe Flacco to an over $100 million dollar deal to ensure he can keep moving the ball downfield to Torrey Smith and Anquan Bolden. Terrell Suggs will have to lead the defense now that super star defensemen Ray Lewis and Ed Reed have parted ways from the franchise. The AFC is a conference loaded with talented teams every season, but this season will be different. Head coach John Harbaugh knows that the Baltimore Ravens will have a target on their back during the 2013 NFL season. Key games at M&T Bank Life Stadium to keep any eye out for will be Raven vs. Steelers, Packers, Patriots, and Texans. 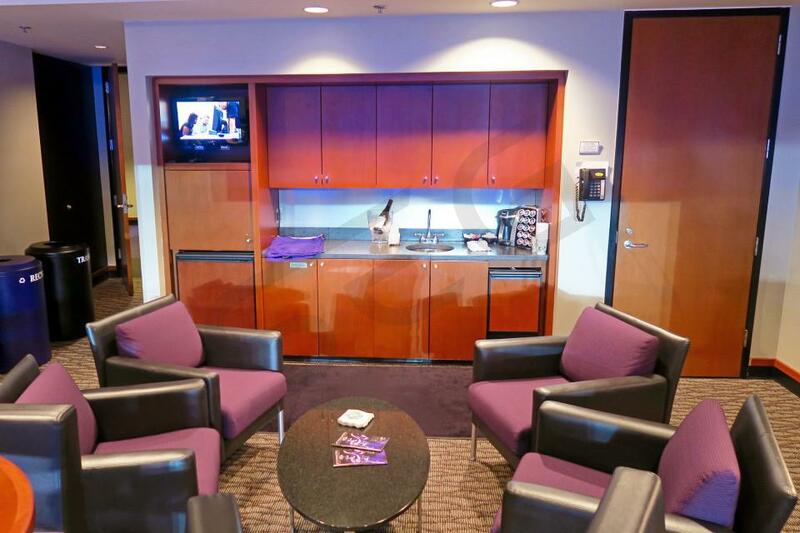 Luxury suites are an ideal setting for any occasion at M&T Bank Stadium. Luxury suites offer an exclusive, private setting for your clients, family, or friends. Game day suites include: 24 tickets, 2 VIP parking passes, option to purchase up to 10 standing room passes, private entrance to stadium and stadium clubs, private restroom, in-suite catering options, climate-controlled environment, premium seating, and HDTV’s. Thank you for signing up for specials at M&T Bank Stadium. Enter your email address below to stay in touch. We'll sign you up for our newsletter, which will inform you of the latest inventory and events at M&T Bank Stadium. We promise we will never sell or distribute your information. 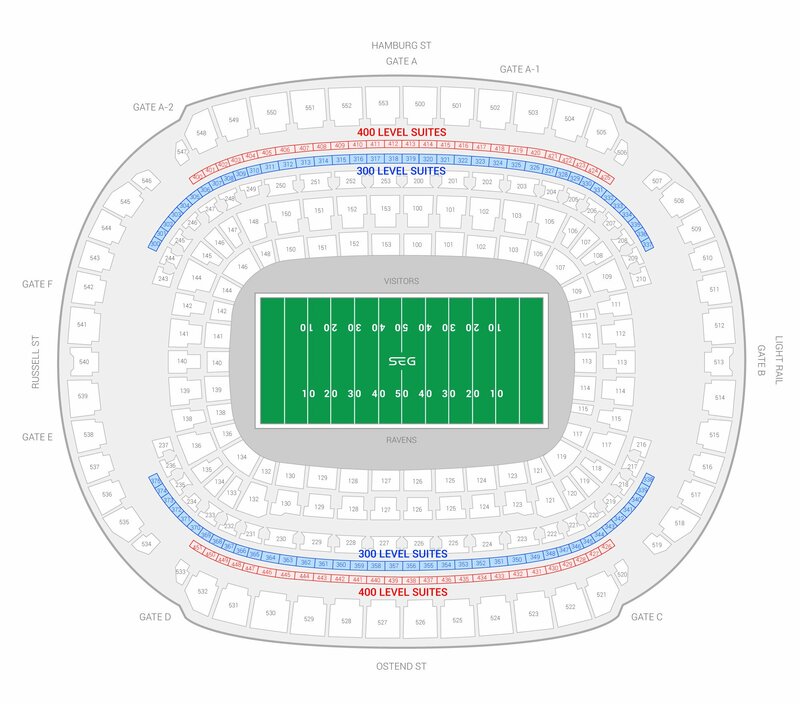 The seating chart below shows where the Baltimore Ravens suites at M&T Bank Stadium are located.